Replacing the straps on outdoor furniture can dramatically improve the furniture appearance and longevity. This is a great option for heavily used furniture at country clubs, apartments, community pools, etc.. We have over 50 colors to choose from. OFR can restrap almost any style of furniture including Brown Jordan Tamiami, Tropitone Marakesh, various box weaves, etc.. Outdoor Furniture restoration has over 100 styles and patterns of high quality outdoor sling fabrics to choose from. OFR can cut the fabric to fit any size chair, chaise, ottoman and most other outdoor furnishings. OFR can also install slings that are supplied by the manufacturer. 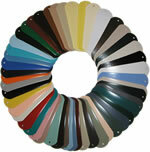 OFR can customize your furniture to your color, strap, and/or sling specifications. Your old furniture will look like new with a high quality finish and new straps or sling when applicable. Steel and Wrought Iron: OFR removes the old finish by sand blasting the pieces down to the bare metal. We then apply a rust-inhibitive primer before applying our catalyzed (two part urethane) paint for a strong, long-lasting finish. Aluminum : OFR preps the surface with a variety of sanding methods that yeild a smooth and paintable surface. The piece is then thouroughly cleaned, dryed and painted with our catalyzed (two part urethane) paint for a strong, long-lasting finish. Outdoor Furniture Restoration can refinish many types of metal items. 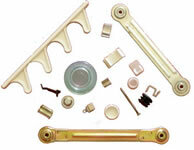 We hand sand to media blast various types of metals to clean and prep for refinishing. ...and of course many types of metal furniture. Custom, high quality, outdoor cushions at an affordable price! Outdoor Furniture Restoration can make custom size cushions to fit most outdoor furniture. OFR uses high quality, UV protected fabrics that are fast drying and very tough to allow for scrub cleaning without damaging the fabric. Perfect for outdoor use. You may find that your furniture will be more comfortable, better looking, and last longer, even if it was not designed for a cushion. Call us today at 513-984-5779 for a quote! Strap, pins, feet, springs, slings, brackets, bolts, clips, caps, and many other miscellaneous outdoor furniture supplies for sale. Customer service: Our ownership prides itself on honesty and integrity. We are never happy unless our customer is happy. Workmanship: OFR has decades of experience. We do work for some of the most prestigious country clubs, communities, and residences in the tri-state area. In many cases our customers have told us their restored furniture is better than it was brand new! Cost: OFR has worked very hard to reduce overhead and streamline the restoration process. If you allow us to quote your job, we are confident you will see the great value in restoring your furniture. Please call us today for a quote!